Parker Dam spans the Colorado River between Arizona and California 17 miles northeast of the town for which it is named. Built between 1934 and 1938 by the Bureau of Reclamation, Parker Dam is one part of a system of storage and diversion structures built by Reclamation to control and regulate the once unruly Colorado River. Parker Dam's primary purpose is to provide reservoir storage from which water can be pumped into the Colorado River (California) and Central Arizona Project Aqueducts. Lake Havasu, the reservoir behind Parker Dam, is about 45 miles long and covers nearly 20,390 acres. It can store 648,000 acre-feet or nearly 211 billion gallons of water. The Colorado River Aqueduct, a man-made river, was constructed by the Metropolitan Water District of Southern California (MWD) and can deliver 1 billion gallons of Colorado River water daily to metropolitan areas in Southern California. The Central Arizona Project, which began pumping water from Lake Havasu in 1985 can divert an average of 1.5 million acre-feet, or 489 billions of gallons from the reservoir each year for delivery to users in central and southern Arizona. Parker, Davis, and Hoover Dams and their powerplants are under the jurisdiction of the Lower Colorado Dams Area Office located at Hoover Dam. The Department of Energy, through the Western Area Power Administration, markets the hydropower produced by these three powerplants to cities as far away as Los Angeles. Parker Dam is the deepest dam in the world; 73 percent of its structural height of 320 feet is below the original riverbed. Men and machines excavated 235 feet into the Colorado riverbed before concrete was placed for the dam's foundation. About 85 feet of the dam are visible. However, the dam's superstructure rises another 62 feet above the roadway across the top of the dam. Parker Powerplant is located on the California side of the Colorado River immediately below the dam. It houses four hydroelectric generating units. Each unit can produce 30,000 kilowatts of non-polluting hydroelectric power. Four 22-foot diameter pipes called penstocks can each carry up to 5500 cubic feet (over 41,000 gallons) of water per second to feed the generating units. About 50 percent of the plant's power output is reserved by MWD for pumping water along the Colorado River Aqueduct to the Pacific Coast. The remaining power is marketed by the Western Area Power Administration. Under the terms of a contract between Reclamation and MWD, and with funds advanced by the latter, excavation for Parker Dam and Powerplant began in October 1934. However, it was not until August 1935 that the Rivers and Harbors Act specifically authorized construction of the dam by the U.S. The dam was completed in September 1938; construction of the powerplant began in July 1939 and was substantially completed in 1942. During construction of the plant, transmission lines and substations of the project were also constructed and put into operation. But because of the onset of World War II, certain features were made with temporary materials or were omitted until proper materials could be made available and installed. Postwar work included replacement of temporary wood supporting structures with permanent steel structures in the substations. Under an agreement between the Bureau of Reclamation and MWD, the latter agency paid essentially the entire cost of constructing Parker Dam. MWD's Whitsett Pumping Plant, 2 miles upstream from the dam on Lake Havasu, lifts water from the reservoir into the Colorado River Aqueduct. Residents of metropolitan Los Angeles recognized many years ago that obtaining domestic and industrial water to meet the needs of the fast growing populace was one of their most pressing problems. The MWD was organized in 1928 to help solve that problem. It was authorized to plan, finance, build and operate a water-supply system from the Colorado River to California cities and other areas within MWD. By 1947, the San Diego Aqueduct was placed in service and the benefits of the system were extended to San Diego County. Between 1952 and 1961, the Colorado River Aqueduct was enlarged to its full delivery capacity of 1,212,000 acre-feet of water annually, or more than 1 billion gallons a day. The Western Area Power Administration transmission system interconnects Parker, Davis and Hoover Dams. It extends to Henderson, Nevada, on the north; Blythe, California, on the west; Yuma, Arizona, on the south; and into Prescott, Phoenix, Tucson and Cochise, Arizona, on the east. The system also includes transmission facilities of the Colorado River Storage Project (CRSP), a system of six major dams and several smaller water development projects that provide multipurpose benefits in the upper Colorado River Basin. CRSP transmission facilities interconnect with the Glen Canyon Powerplant and Pacific Northwest-Pacific Southwest Intertie facilities. The total system consists of 2800 miles of high-voltage transmission lines serving 40 power substations managed by a Central System Dispatching Office in Phoenix, Arizona. The installed generating capacity of Colorado River projects managed by Western is about 3000 megawatts -- enough energy to provide electric service for a year to more than two million homes. More than 9.5 billion kilowatt-hours of Colorado River hydroelectric energy is marketed each year, resulting in annual revenues to the U.S. Treasury of more than $140 million. Constructed by the Bureau of Reclamation between 1973 and 1992, the Central Arizona Project can deliver approximately 1.5 million acre-feet (488 billion gallons) of Colorado River water each year for cities, industries, Indian communities and agricultural areas in central and southern Arizona. Water pumped from Lake Havasu behind Parker Dam is transported to Phoenix via the 190-mile-long Hayden-Rhodes Aqueduct, which began delivering water in 1985. Water deliveries from the Fannin-McFarland Aqueduct, the second portion of the system, began in 1986. The final section, the Tucson Aqueduct, first delivered water to the Tucson area in 1992. Colorado River water is delivered to users by pumping it from Lake Havasu into the conveyance system, then relifting it through a series of pumping plants across the state. From Lake Havasu to the end of the aqueduct, the water is lifted nearly 2,900 feet in elevation. Parker Dam provides a reservoir from which water is pumped to the Colorado River Aqueduct and the Central Arizona Project. The powerplant produces non-polluting hydroelectric energy for homes and industry throughout the Southwest. Parker Dam also performs other functions. It provides flood control, capturing and delaying flash floods discharged into the river from tributaries below Davis Dam. It re-regulates water releases from Hoover and Davis powerplants, smoothing out the Colorado's flow for the benefit of downstream irrigators. It has created a major recreational area in an arid region where large natural bodies of water are nonexistent. Fishing, boating, swimming, and water skiing are some of the pastimes enjoyed by visitors at Lake Havasu. Campgrounds, trailer parks, cabins and boat docks are provided at several locations on the lakeshore for public use. Lake Havasu City, a growing Arizona community, developed after Lake Havasu was created by the dam. Lake Havasu's deep water, fringed with coves and inlets, provides ideal fishing conditions for black and striped bass, crappie, bluegill, catfish and trout. Through a multi-agency fishery enhancement program, artificial habitat has been developed to increase the game fish populations, and several shoreline fishing access points have been created around the lake. Several isolated coves in Lake Havasu have also been set aside for biologists to raise populations of 2 endangered native fish -- the razorback sucker and bonytail. In these predator-free coves, small spawn of these species are raised until they reach about 12-inches in length -- large enough to escape the predatory fish. They are then tagged and released into the lake to help expand the populations of these endangered fish, and reduce the threat of their extinction. Topock Marsh, part of the Havasu National Wildlife Refuge, is just north of Lake Havasu. The marsh is a major fish and wildlife habitat. When changing water levels threatened to destroy it, Reclamation, in cooperation with the Fish and Wildlife Service, began rehabilitation work in 1965. Today, inlet and outlet structures control the flow of river water into the refuge, and a dike encompassing the marsh has stabilized the water level. Dredge channels in the marsh have improved deeper and cooler water fish habitat. Artificial islands constructed in the marsh have become home to many species of birds and waterfowl. 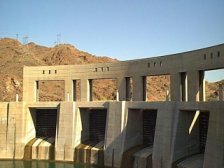 SELF GUIDED TOURS ARE NO LONGER AVAILABLE at Parker Dam. However, visitors are welcome to park in the turnout on the California side of the dam and view the features and interpretive panels around the site.